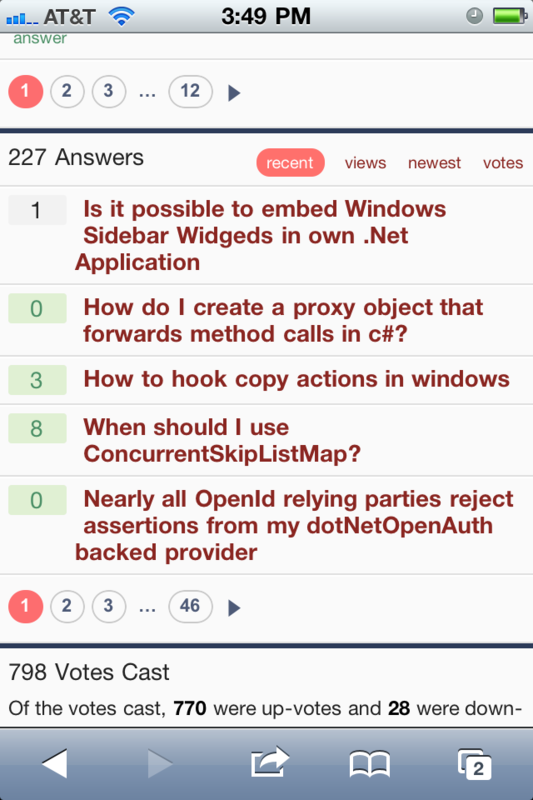 On Stack Exchange, we’ve just rolled out a brand spanking new mobile site. This took about 6 weeks of my and our designer’s (Jin Yang) time, the majority of it spent building mobile Views. 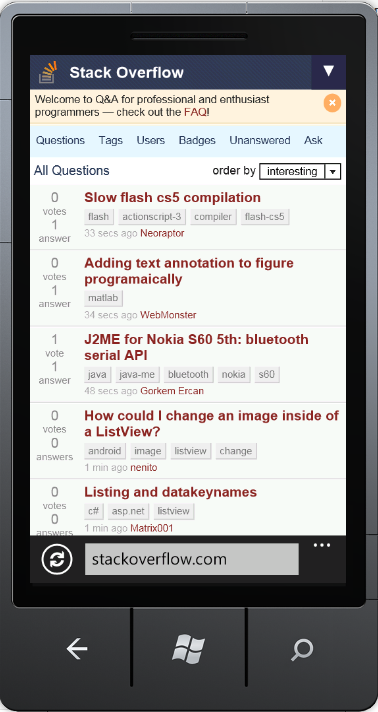 Very little time was spent hammering mobile View switching support into MVC, because it’s really not that hard. A nice thing about the Stack Exchange code base is that all of our Controllers share a common base class. As a consequence, it’s easy to overload the various View(…) methods to do some mobile magic. If your MVC site doesn’t follow this pattern it’s not hard to slap it onto an existing code base, it is a pre-requisite for this approach though. CheckForMobileEquivalentView() looks up the final view to render, in my design the lack of a mobile alternative just falls back to serving the desktop versions; this approach may not be appropriate for all sites, but Stack Exchange sites already worked pretty well on a phone pre-mobile theme. 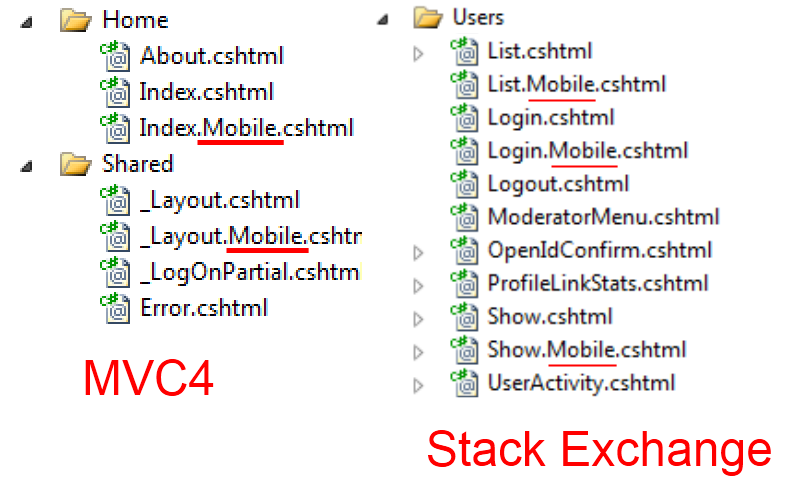 The caching isn’t interesting here (though important for performance), the important part is the convention of adding .Mobile to the end of a View’s name to mark it as “for mobile devices.” Conventions rather than configurations, after all, being a huge selling point of the MVC framework. And that’s basically it. Anywhere in your Controllers where you call View(“MyView”, myModel) or similar will instead serve a mobile View if one is available (passing the same model for you to work with). If you’re doing any whole cloth caching (which you probably are, and if not you probably should be) [ed: I seem to have made this phrase up, “whole cloth caching” is caching an entire response] you’ll need to account for the mobile/desktop divide. All we do is slap “-mobile” onto the keys right before they hit the OuputCache. Another neat tidbit (though MVC itself gets most of the credit here), is the complete decoupling of view engines from the issue. If you want Razor on mobile, but are stuck with some crufty old ASPX files on the desktop (as we are in a few places) you’re not forced to convert the old stuff. In theory, you could throw Spark (or any other view engine) into the mix as well; though I have not actually tried doing that. As an aside, this basic idea seems to be slated for MVC per Phil Haack’s announcement of the MVC4 Roadmap. I’ve taken it as a validation of the basic approach, if not necessarily the implementation. What do you mean by “whole cloth caching”? I realize I may have made that phrase up. Oh well.